C&M Tile and Granites is pleased to provide an online gallery of our quality line of products, including tile, marble, stone, glass, manufactured stone and ceramic products. With hundreds of products available, we can assist homeowners, contractors, interior designers and architects with unique choices for their design needs. Change the entire look of your home or business! Our team of friendly and knowledgeable professionals is here to assist you each step of the way, whether you're installing flooring, a natural stone countertop, vanity top, a fireplace surround, a ceramic bath surround, backsplashes or mosaics, we have hundreds of samples on hand to choose from. 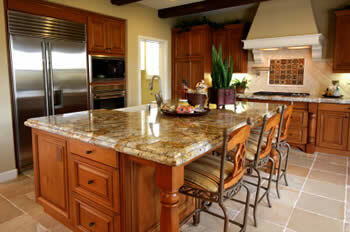 Experience the luxurious look and feel of granite. With its high compressive strength and durability, granite is the hardest structural stone and makes an excellent choice for flooring, countertops, vanities, as well as exterior applications. Marble is known for its rich, beautiful colours, and can enhance any interior space, adding an element of luxury and style. Texture of marble can vary depending on the form, size and uniformity of the grains. Porcelain and ceramic tile is ideal for high-traffic interiors due to their stain- and wear-resistant properties. Different colours can be added to the white clay base to resemble stone products. Best of all, they're easy to keep clean, and do not show fingerprints! We supply Stone Selex and Canyon Stone manufactured stone, an affordable, alternative stone veneer that adds beauty and value to your home. These manufactured stone veneers are environmentally-friendly, and have the look and feel of real stone. Great for interiors or exteriors. Glass tile has lasting durability and offers a wide range of translucent and iridescent colour palettes, including mosaic patterns. Glass tile is an ideal choice for creating beautiful and modern living spaces. Limestone offers a soft and subdued colour palette, usually ranging between soft beiges and tans. Limestone is suitable for countertops, floors, bathrooms and fireplace surrounds, providing a casual and comfortable feel. Add interest to your home or business with the beautiful patterns that mosaics provide. Natural stone mosaics offer style, elegance, and an artistic appeal. Select from various combinations of patterns and colours! Our selection of antiqued travertine pavers are resistant to frost damage and guaranteed for life! They're ideal for pool surrounds, patios, driveways, and walkways, as they have a non-slip, tumbled surface. Best of all, there is no maintenance necessary.